Data corruption or loss does happen occasionally and the results can be disastrous. The only sure way to survive this is by ensuring that you have regular backups of all critical data. We see this as so important that we built automated backups directly into AuditMate. If this is set, every time you exit a client, an AutoBackup will be created in this folder. This is a zipped backup named with the date and time of the backup. The result is that multiple AutoBackups are created as you progress through the client assignment. 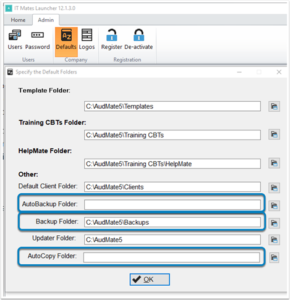 Zipped backups must be ‘Restored’ into a client folder in order to be accessed again as they are system password protected. This is the default folder for manually initiated backups. A zipped backup file is created. If this is set, every time you exit a client, an AutoCopy will be created in this folder. This is a Copy of the current client files and has no passwords associated with it. This is useful for copying current client files to a DropBox, Google Drive or OneDrive folder for cloud backups. Backups are important, please take them seriously. Previous Post Super-charging the Cycle of Success! Next Post What is happening with iXBRL?